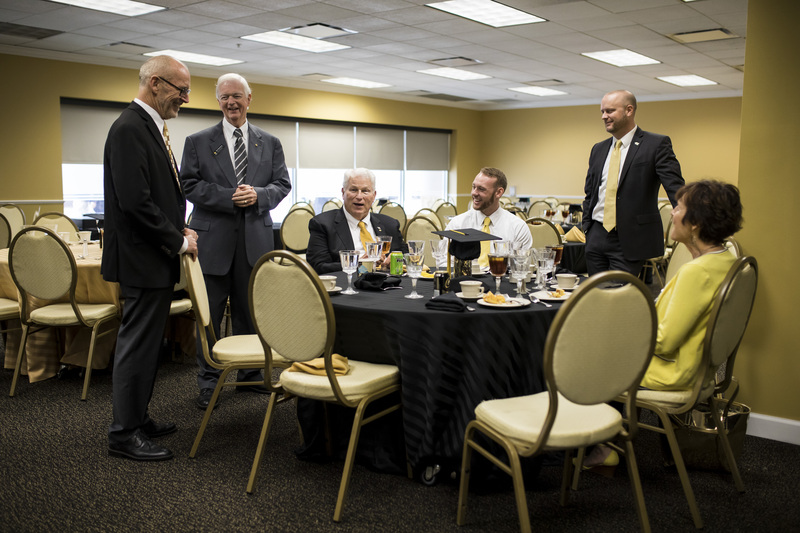 As a tradition, Hitt has lunch in the the Live Oak Event Center’s Cypress Room before an afternoon commencement ceremony. 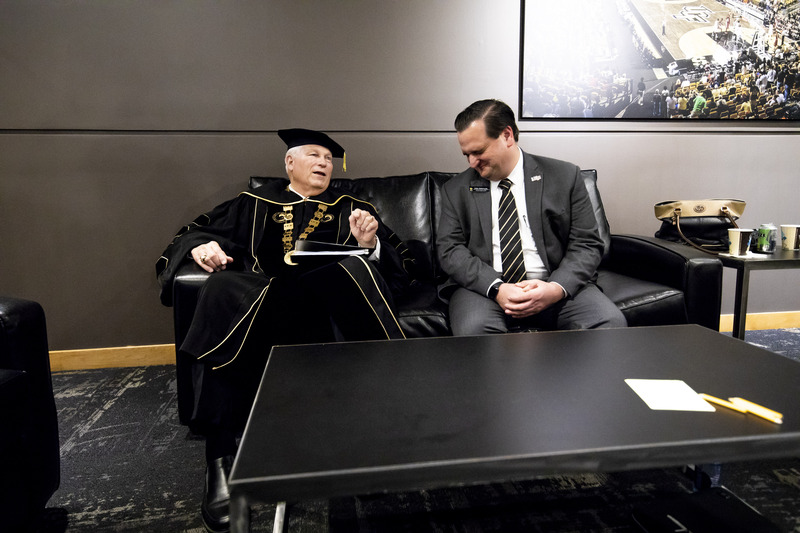 He is joined by Rick Schell, vice president and executive chief of staff for the president’s office; Dan Holsenbeck, senior vice president of university relations; Nick Larkins, Student Government Association president; Grant Heston ’13, vice president of communications and marketing; and Maribeth Ehasz, vice president for student development and enrollment services. 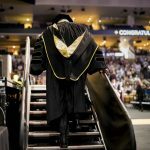 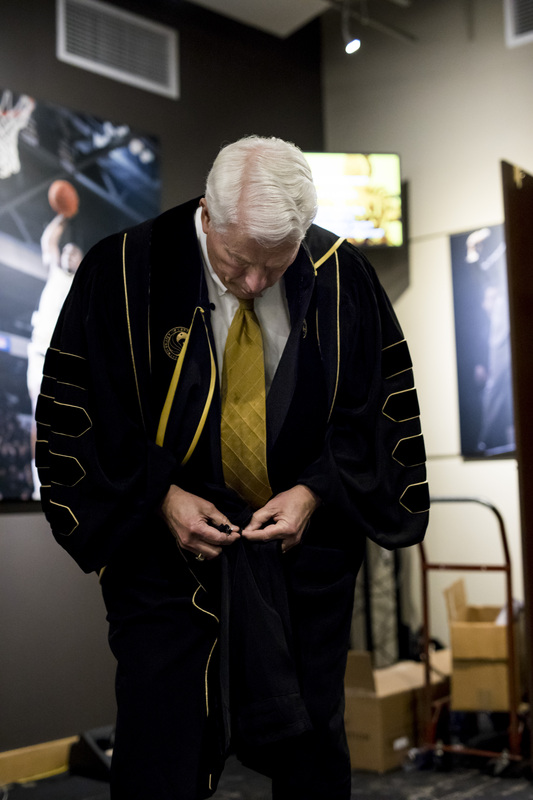 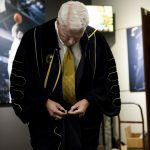 Hitt heads to the Black and Gold room inside CFE Arena to get dressed for commencement. 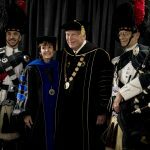 Hitt puts on his regalia. 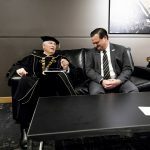 Hitt waits with UCF PD Sergeant Peter Osterrieder, the president’s personal security detail, before making their way to a ceremony. 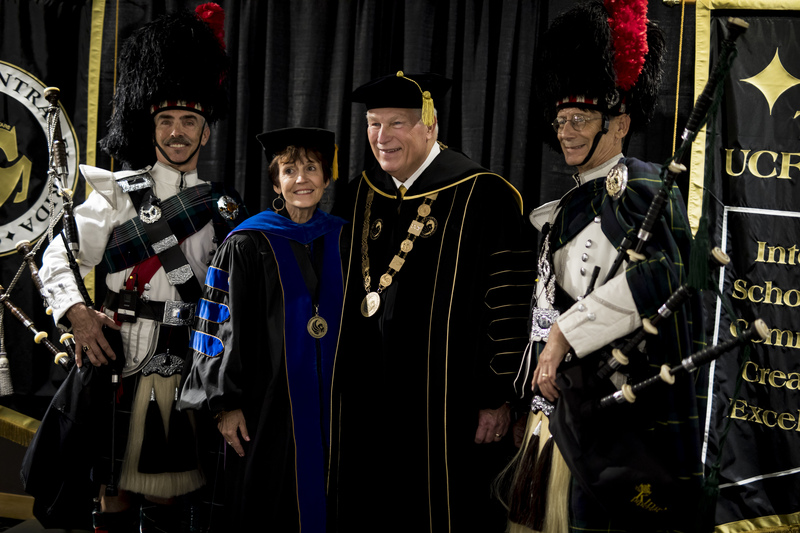 Hitt poses for a photo with Ehasz and two bagpipe players. 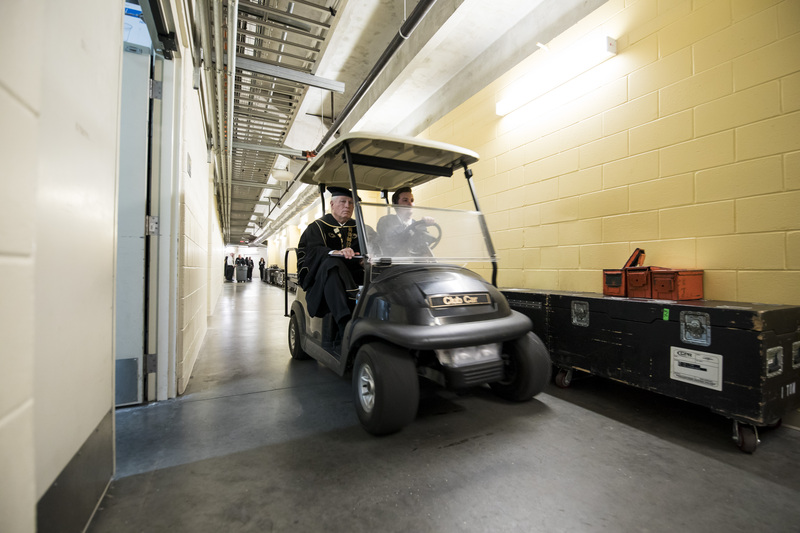 Hitt is escorted via golf cart to the staging area inside the CFE Arena. 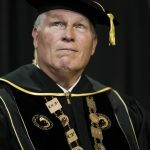 Hitt takes the stage to make his opening statement. 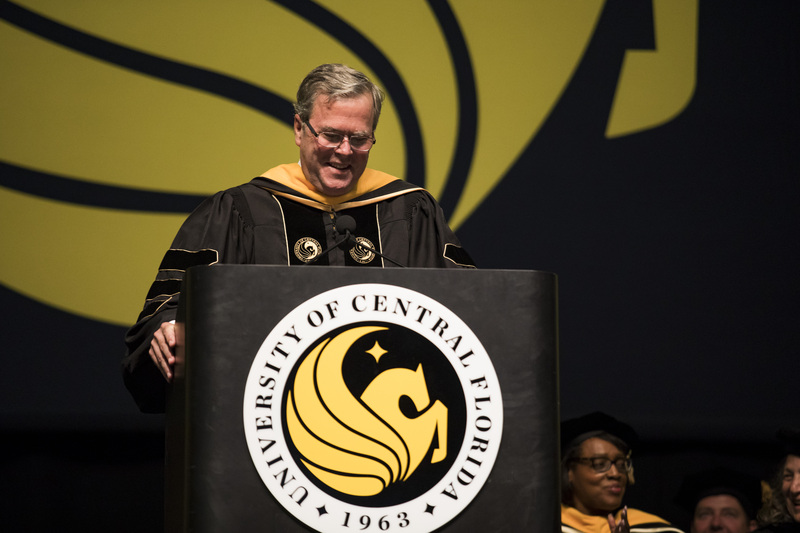 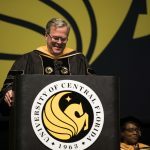 Former Florida Governor Jeb Bush spoke at the commencement ceremony for the College of Graduate Studies, College of Medicine, College of Undergraduate Studies and Rosen College of Hospitality Management on May 3. 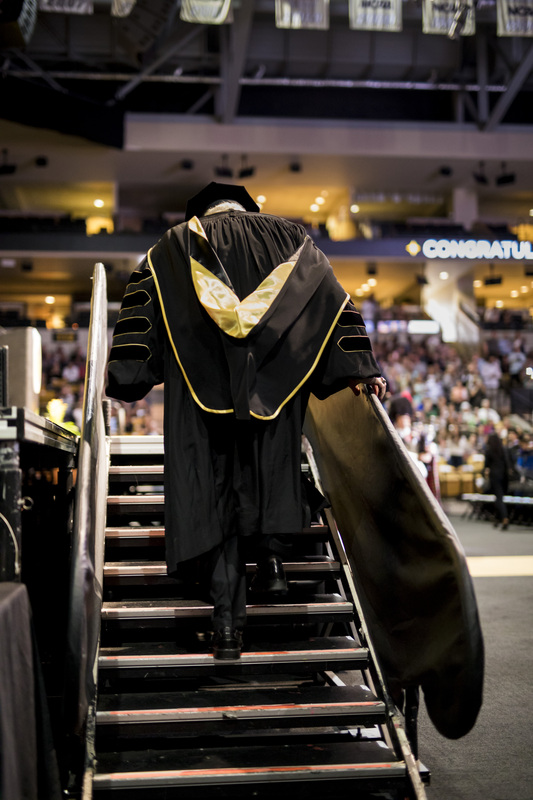 A student looks up at the packed arena as he waits to cross the stage. 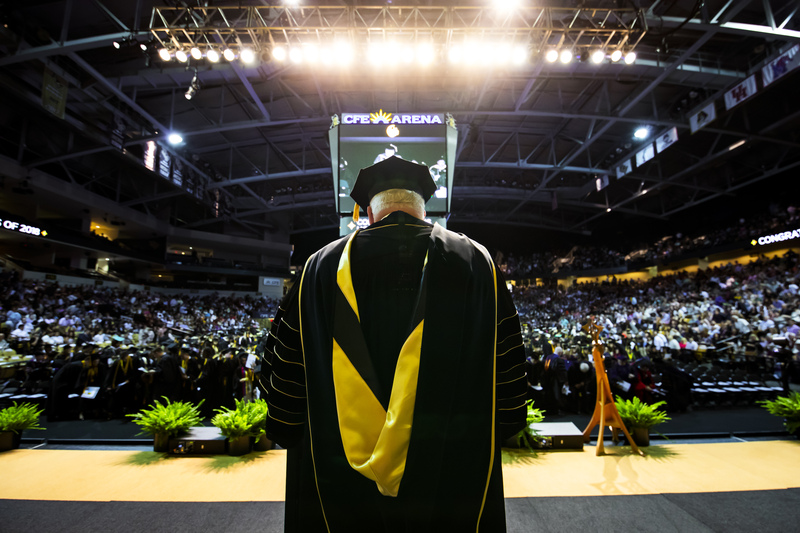 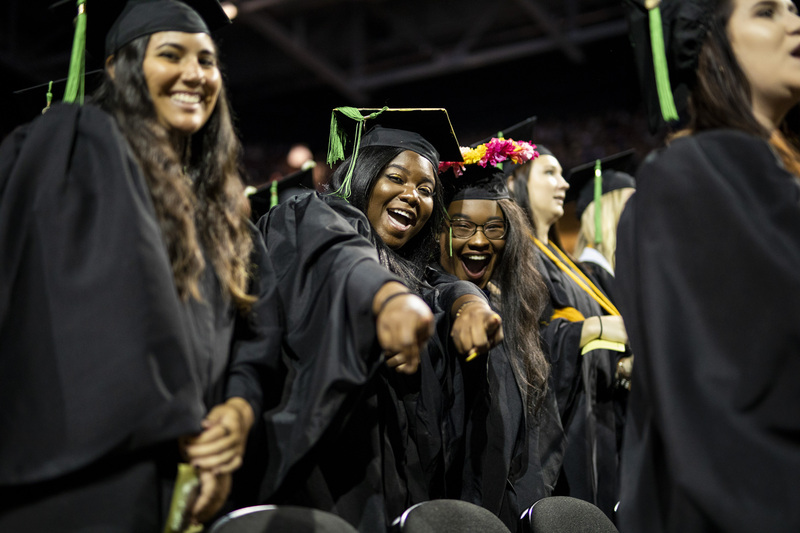 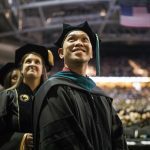 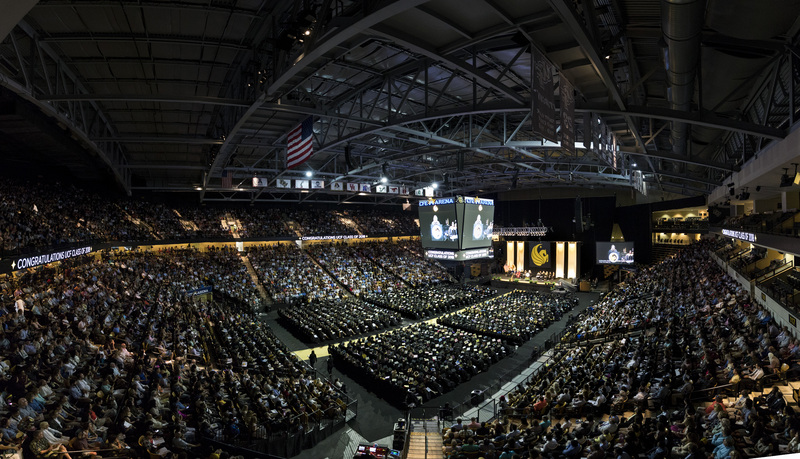 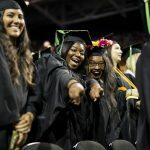 Twenty-five percent of UCF graduates this spring were first-generation students. 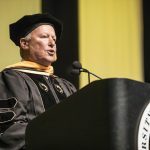 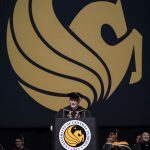 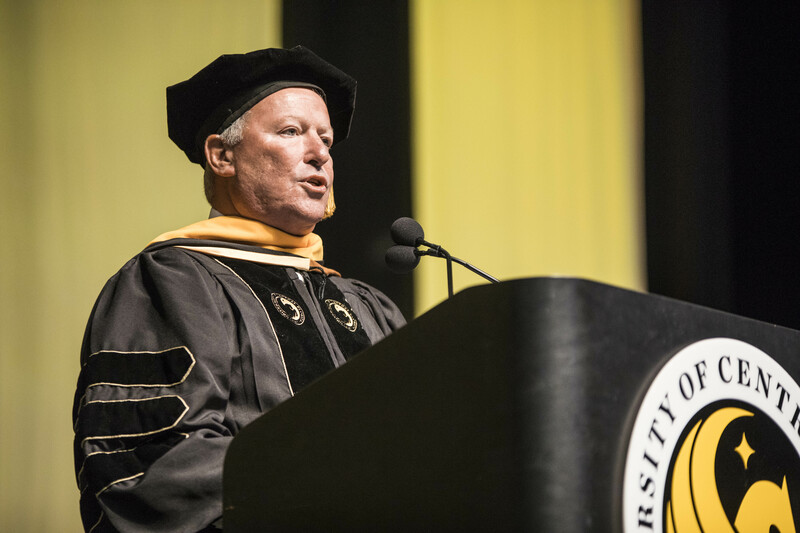 Orlando Mayor Buddy Dyer delivers the commencement address during the College of Sciences’ ceremony on May 4. 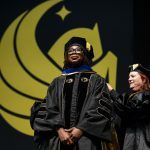 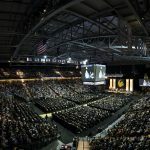 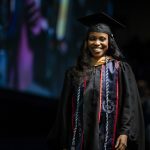 At six ceremonies spanning three days, more than 8,100 students walked across the stage to accept their diplomas this spring. 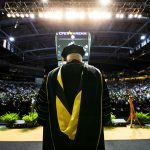 In 1970, when the university was Florida Technological University, 423 students graduated during the first commencement. 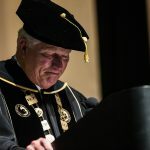 During Hitt’s first year as president 4,539 students graduated. 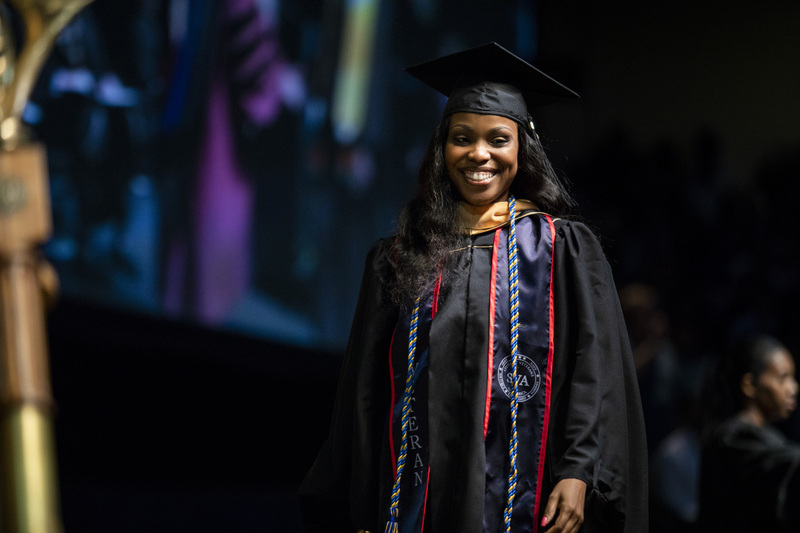 A veteran student smiles as she crosses the stage. 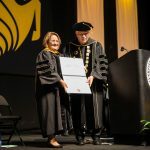 Orange County Mayor Teresa Jacobs receives an honorary doctorate degree for public service during the College of Health and Public Affairs’ ceremony on May 5. 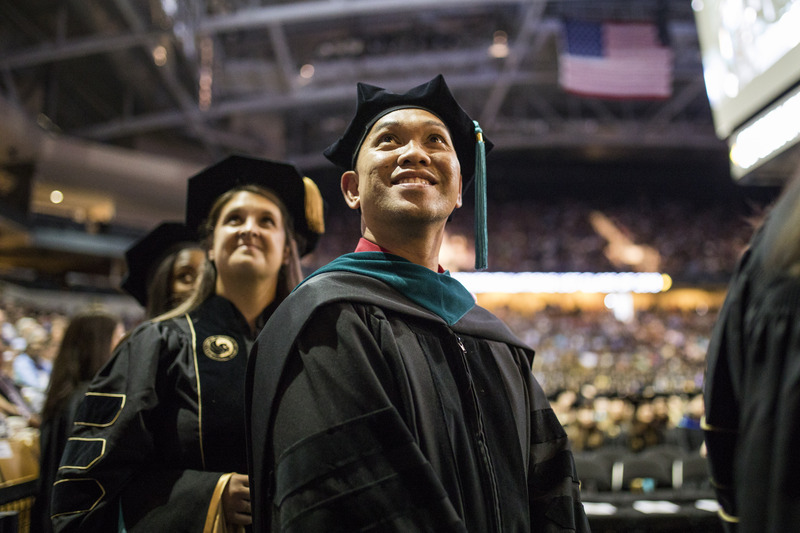 Two students from the College of Health and Public Affairs express their enthusiasm as the ceremony nears the end. 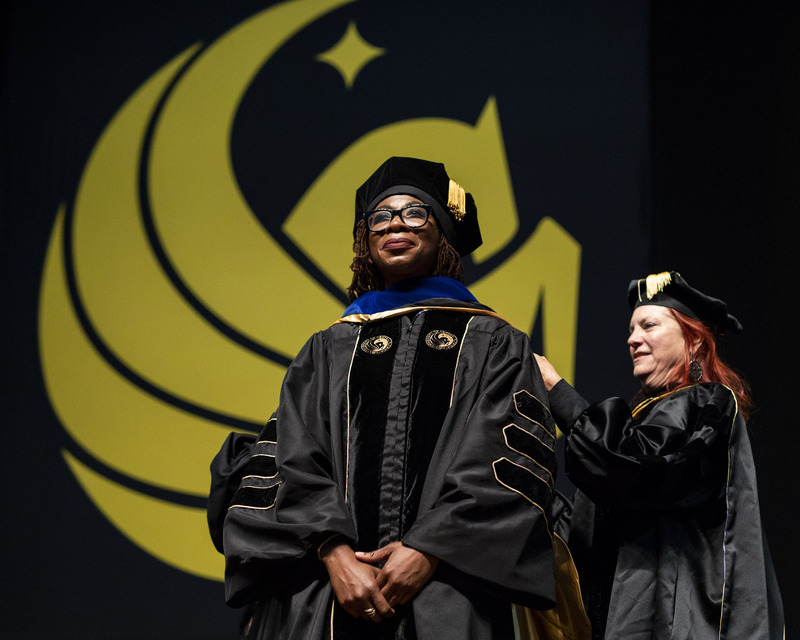 A doctoral student is hooded. 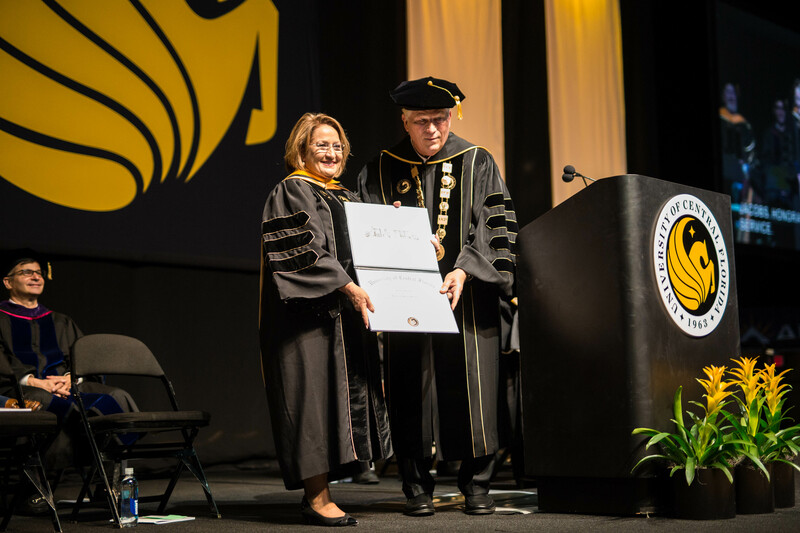 Hitt has awarded more than 5,100 doctoral degrees during his presidency. 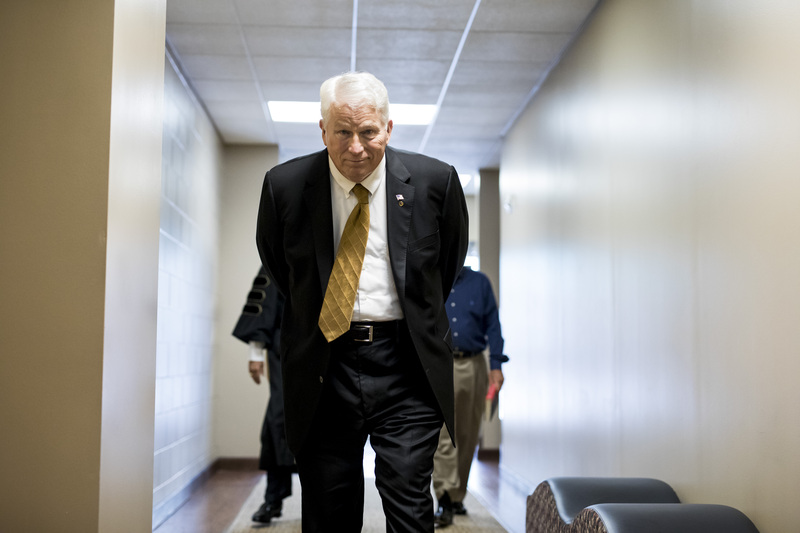 Prior to his tenure only 128 had been awarded. 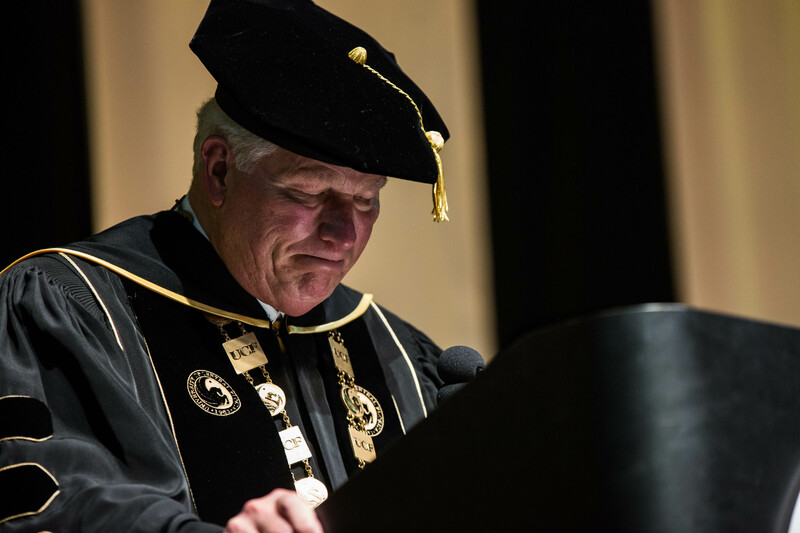 Hitt gets emotional during his closing remarks. 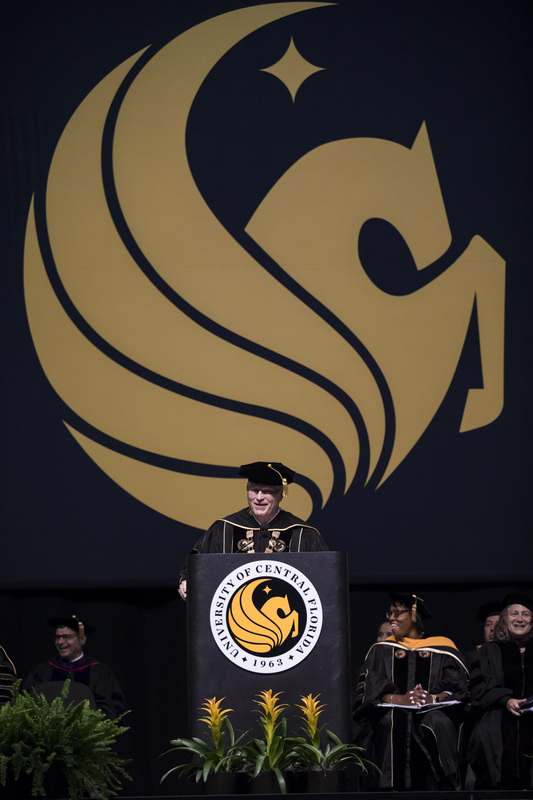 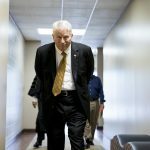 Of the more than 325,000 degrees earned at UCF, Hitt has awarded 83 percent of them. 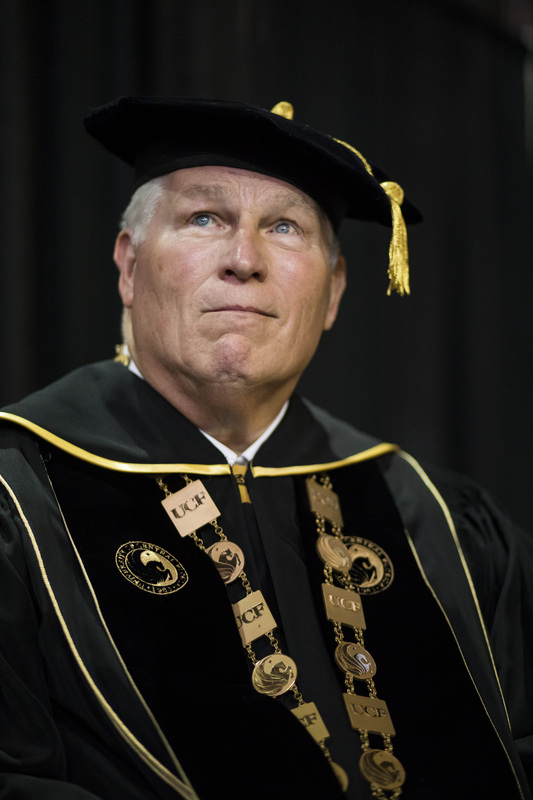 “Thank you for the honor of serving as your president for 26 years,” Hitt says.